Carolana, "land of Charles," referred to the area south of Virginia granted on 30 Oct. 1629 by King Charles I to his attorney general, Sir Robert Heath. The grant was part of the Crown policy to expand England's overseas empire at little royal expense or effort by distributing Proprietary charters to individuals who were then obligated to develop their holdings. 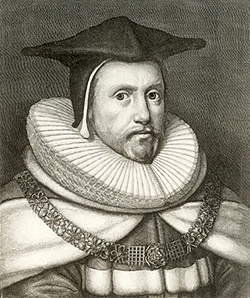 Carolana included the territory between 31° and 36° north latitude, and Heath was given broad authority for self-government under the Bishop of Durham clause, although his legislative power was limited by requiring "the counsel, assent & approbation of the Freeholders." The Carolana grant apparently was motivated by the inquiries into colonization by French Huguenot refugee M. de Belavane, an agent of the Baron de Sancé. Also involved in the venture was a Puritan merchant of Huguenot ancestry, Samuel Vassall, who began the Vassall family's interest in colonization of the region that extended into the Carolina Proprietary of 1663. The Sancé group received permission to settle in Carolana on 19 Mar. 1630. Although plans moved forward to establish a colony, no expedition succeeded in reaching the area. Vassall then took the initiative to keep the project alive by engaging Henry Taverner, master of the ship Thomas, to look for suitable colonizing sites along the Carolana coast. Following his exploration, Taverner transported colonists from England in the fall of 1633 but was unable to reach Carolana, leaving them stranded in Virginia. Heath, in 1632, had assigned the patent to Carolana to Henry Frederick Howard, Lord Maltravers, who in 1637-38 founded the county of Norfolk and appointed a deputy governor, Henry Hartwell, for the northern half of the province. Despite his plans, there is no evidence that Lord Maltravers was any more successful than Heath had been. The onset of civil war in England ended the interest in colonial ventures by courtiers. The Carolana grant is important because it signifies the first time the area south of Virginia was envisioned as a separate colonial territory, and it is the original source for the name "Carolina." Paul E. Kopperman, "Profile of Failure: The Carolana Project, 1629-1640," NCHR 59 (January 1982). William S. Powell, "Carolana and the Incomparable Roanoke: Explorations and Attempted Settlements, 1620-1663," NCHR 51 (January 1974). Coxe, Daniel. A description of the English province of Carolana. St. Louis: Churchill and Harris. 1840. http://archive.org/stream/descriptionofeng00incoxe#page/n11/mode/2up (accessed October 15, 2012). Lewis, J.D. "What Really Happened Between 1629 and 1663?" Carolana.com. 2007. http://www.carolana.com/Carolina/Proprietors/1629to1665.html (accessed October 15, 2012). Lewis, J.D. "Sir Robert Heath." Carolana.com. 2007. http://www.carolana.com/Carolina/Proprietors/sirrobertheath.html (accessed October 15, 2012). Hollar, Wenzel. "Sir Robert Heath. State 2." 1664. University of Toronto Wenceslaus Hollar Digital Collection. via Wikimedia Commons. http://commons.wikimedia.org/wiki/File:Wenceslas_Hollar_-_Sir_Robert_Heath_(State_2).jpg (accessed October 15, 2012). Concise, good command of the facts, well written.